Image of the Day: The Orion Molecular Cloud -An Engine of RNA Worlds? 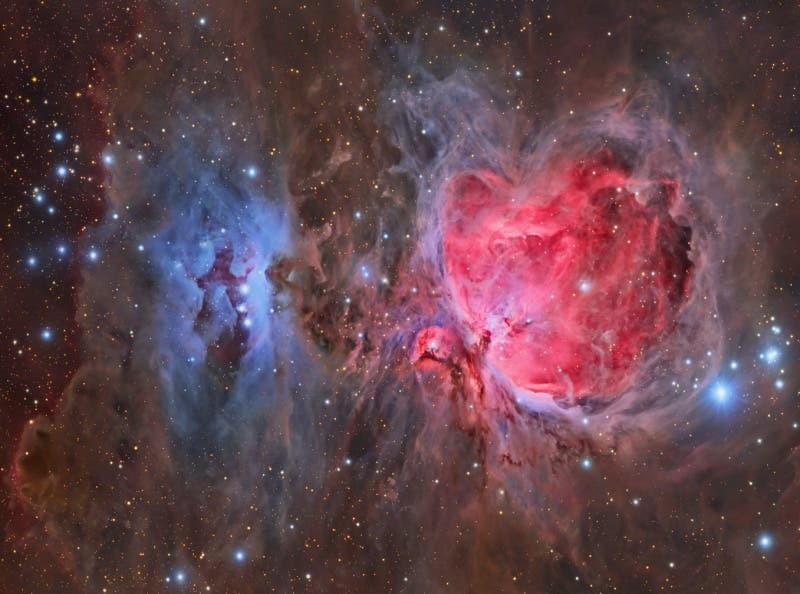 The Orion Nebula, also known as M42, is one of the brightest and most famous nebulae in the sky. The star forming region's glowing gas clouds and hot young stars are on the right in this sharp and colorful two frame mosaic that includes the smaller nebula M43 near center and dusty, bluish reflection nebulae NGC 1977 on the left. Located at the edge of an otherwise invisible giant molecular cloud complex, astronomers have also identified what appear to be numerous infant solar systems. Orion is a cosmic zoo, with protoplanetary disks, brown dwarfs, intense and turbulent motions of the gas, and the photo-ionizing effects of massive nearby stars as well as supersonic "bullets" — each ten times the diameter of Pluto's orbit and tipped with iron atoms glowing bright blue, believed to have been formed one thousand years ago from an unknown violent event. Nebular clouds are thought to be most likely environment for synthesizing and promoting the evolution of molecules needed for the origin of life. Giant gas nebulae such as Orion are storehouses of sugars that form ribose — the backbone of RNA. With a universe full of sugar, it's possible that early RNA worlds were generated and are evolving in their own unique ways throughout the observable universe. RNA coding is what gave primitive cell structures the catalyst they needed to become life. 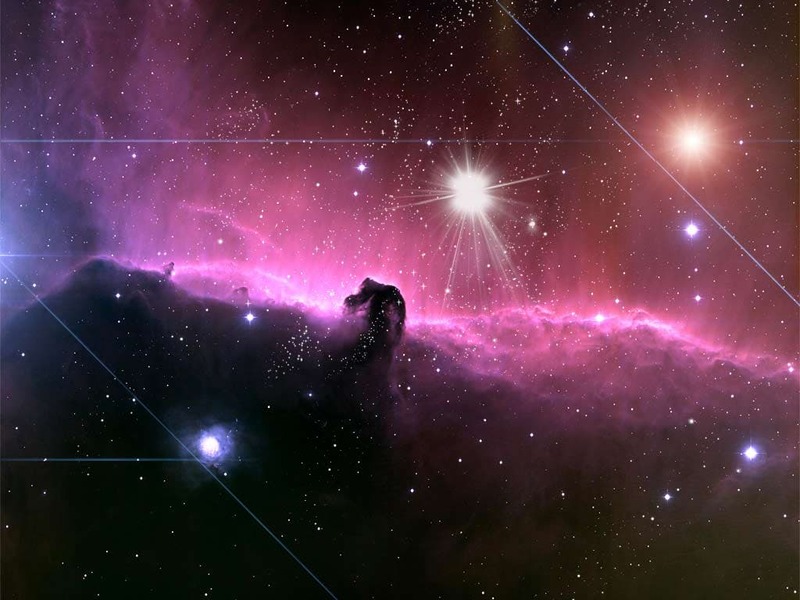 The building blocks for DNA could have been generated or combined within interstellar clouds and DNA would become part of the molecular-protein-amino acid complex. Hydrogen, oxygen, carbon, calcium, sulfur, nitrogen and phosphorus for example are continually irradiated by ions, which can generate small organic molecules which evolve into larger complex organic molecules that result in the formation of amino acids and other compounds. 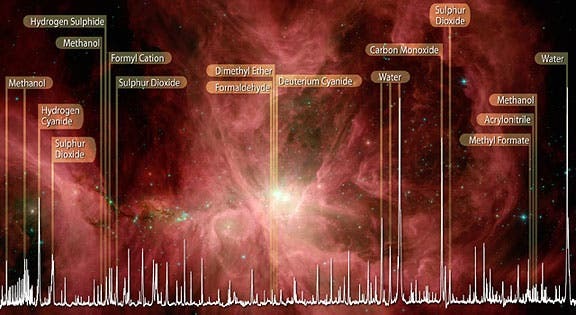 In 2009, the Herschel Space Observatory using the telescope's heterodyne instrument for the far infrared revealed the chemical fingerprints of potentially life-enabling organic molecules in the Orion nebula, one of the most prolific chemical factories in space, although the full extent of its chemistry and the pathways for molecule formation are not well understood. By sifting through the pattern of spikes in the spectrum, astronomers have identified a few common molecules that are precursors to life-enabling molecules, including water, carbon monoxide, formaldehyde, methanol, dimethyl ether, hydrogen cyanide, sulfur oxide and sulfur dioxide. Elsewhere, scientists are using the giant Robert C. Byrd Green Bank Telescope (GBT) to prospect in Sagittarius B2(N), a giant molecular cloud near the center of our Galaxy, some 25,000 light-years from Earth for other new, complex molecules in interstellar space that may be precursors to life. Koninga, N., et al., (2008). Organic molecules in the spectral line survey of Orion KL with the Odin Satellite from 486–492 GHz and 541–577 GHz. Proceedings of the International Astronomical Union, 4, 29-30. Kensei K., et al., (2008). Formation of amino acid precursors with large molecular weight in dense clouds and their relevance to origins of bio-homochirality. Proceedings of the International Astronomical Union, 4:465-472.